In August, my 2017 Mercedes C300 coupe lease will be up, and after looking at the Camaro 3LT and Alpha Romeo TiSport, I'm pretty sure I'll be leasing a 2019 Stinger GT2. Aside from the C300, in the last 20 years I've had a 2002 BMW 325 (for 11 years) and a BMW 2005 Z4 (for 10 years), and a 2013 ATS (which I'm keeping for a few more years as I consider it my BMW replacement)...all bought new. No tracking, just pleasure driving. I have only driven the GT2 once and really enjoyed the ride, but given the above driving history, I'd like to hear a comparison between the GT2 and any of the above cars from guys who have had any of the above cars. Comparisons don't have to be extensive as I'm really interested in knowing if I'll be disappointed with the GT2. At this point, I don't think so, but, nonetheless, I'd appreciate your opinions (both + and -). Thanks. Welcome! We "my wife" currently own a 2016 C300. I can tell you surprisingly the overall quality on our Stinger is on par that of the C300. You're definitely going to enjoy the added room of the Stinger, trunk space and rear leg room is much more ample than on the C300. One thing for sure is you're going to really enjoy the power difference on the Stinger which is more comparable with the C43. That said, the 4matic system on the C300 to me is a bit more refined than the AWD system on the Stinger, but overall its not bad. Thanks, kezzer. Yeah, I'm looking forward to a "little" extra power; and to know that the GT2's overall quality is on par with the C300 is a big plus. All my cars have been RWD, and that's what I'll be getting with the GT2; so that's a comparison I'd like to see. Compared to most mainstream sedans, the GTs features are on par if not better. The UI is very easy to use, and has both CarPlay and Android Auto (unlike BMW for e.g. which only has CarPlay). The steering is tighter (in sports mode) and easily as accurate if not more so. It's handling is better than the last gen C class, A4, and 3 series, but not better than the latest 3 series that's just launching, and not better than the Genesis G70. However, giving up a tiny bit on the handling, nets you far better ride (in Comfort mode) than any of these. I routinely drive to work past a parkway full of potholes and even on my 19� wheels, I don't feel uncomfortable. Compared to my Golf R, it's far less bumpy and jarring. If you're not a tracking guy, you'll find this holds corners very, very well. It's not as tight as say my 2002 BMW M3 was, but it's not that far off, and it's way more comfortable. The shape of the GT stands out and will get you much more attention (to me that's a negative btw but I love the shape of this car so much, just not the attention), and much more practicality due to the hatchback trunk. You can squeeze very large items in there with the seats down thanks to that hatch. Frankly, in your shoes, I'd be trying to decide not between the GT2 and a BMW or traditional sports sedan, but between the GT2 and the Genesis G70. That's a much tougher choice at the top end where the pricing pretty much meets at $52k MSRP fully stocked. 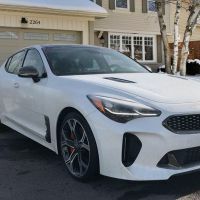 Hyundai/Kia are far more reliable than any of the cars you mentioned, they've upped their game insanely quickly, and these sedans compete head on with the 440i 4 door coupe, Audi S5, etc which cost $10k more minimum. Then you get the 10 year engine and transmission warranty too. The final thing I'd consider at this stage is that Genesis will give you a much better service experience than Kia. Good luck. Torbach, thanks for your nice review. And, you are right about my thinking of the G70, also...which I am! I have no problem with the GT2 not quite being up to the some of the branded sport sedans, but as you say (and so have others,) if not tracking (which I won't be doing,) it's a small difference to accept as the car will have all the good bells and whistles at a ridiculously lower price. As for the G70, I think at my stage of the game (80yo) I can give it up a little on handling not having the Genesis' brand service attention, and interestingly enough, I like the GT2's dash better. Oh yeah, another difference that hopefully some of my friends will appreciate: They have trouble getting in and out of my 2013 ATS (my BMW substitute) and may find things a little more comfortable in the GT2...and if they don't, that's going to be OK, too. Well, I think you've hit the perfect choice based on your reply. Getting in both front and rear seats is way easier than the ATS. But the rear seats are not perfect for folks taller than 6' just because of that sloping hatch. I'm not 80, but at 46, I appreciate the comfort/GT nature of this car a lot. It's a true GT car and it's a blast to drive and live with daily. I also love that it's infotainment system is so easy to use. I don't need any BMW iDrive or Audi MMI or that terrible Cadillac system (sorry). The Stinger system is very responsive, intuitive, and feature rich. No trackpad or other unnecessary nonsense. From your replies I am watering at the mouth to get the GT2, now! But, alas, I will have to wait until the C300's lease is up in August. BTW, I really never had any problem with the ATS' infotainment system, although I do realize it may not be the best.